As a young man, at age 17, it was time to seek employment away from the farm. I found employment at Becker Cabinet where I was under the teaching and tutorship of Mr. Becker. I received a basic knowledge of cabinet and furniture building. This gave me a start to what later would become Wheatstate Wood Design. After eight years at Becker Cabinet, I returned to the farm and worked together with my dad in his slowing-down years. I also did some part-time construction work, which again got my fingers into cabinet building. During the years between Becker Cabinet and starting my own shop, I was chasing classified ads and buying a limited amount of shop tools as I could afford them. Most of the stationary tools were from the used market, since I was not of the mind to start my own business. We started in the old milk barn. It was rather small, but it worked for a hobby. After the Hesston tornado in March of 1990, the old milk barn came down to make way for a new shed that replaced the old farm buildings destroyed by the tornado. We then partitioned off a corner of the blacksmith/mechanic/farm shop (20'x35') to make a cabinet shop. In mid-2000, the door opened to start our own business. In a very small way, with the help of other local shops, we picked up a little work that they maybe didn't want to do... passing it on to us, giving us the start of a small business. We purchased the Ornamental Mill, also known as a lathe, in 2003. This gave us more options for the furniture line, making us able to turn posts and spindles for furniture. Later we traded it for a CNC lathe. This gave us the opportunity to do custom turning for other shops as well. In 2006, the grain farming was lacking attractive profit margins, farming was losing its appeal, and the shop was gaining momentum. With the farming becoming history, the wood shop took over the entire building. With the sale of our farm equipment, the cabinet shop gained some extra cash to invest in some new and updated tools. As time moved on and Christopher was old enough, he mercifully joined me in the shop, taking responsibility of the computer side of the business, and building as well. He later became a business partner and took over more of the shop operation. Summer of 2012 brought another small expansion. We added a small showroom, giving us a place to store and display a little furniture. In the summer of 2013, the decision was made to purchase a new CNC Router. This expanded the possibilities of what we could do. It also gave us custom cutting and milling opportunities for other local shops. Decisions like the CNC router have not been easy decisions for a small-scale shop, but looking back, the $100,000 was well-spent. The fall of 2014 brought more change. The family run shop was overrun with the amount of work, causing us to hire our first employee. Today the shop is still a small shop with several men on the payroll. Our customers mean a lot to us. With the blessing of God, and many loyal customers, we have been able to stay in business. We like to think we are building heirlooms that will be passed from one generation to the next. Liberty Bell Table with Rough-Sawn Wood. Click the link to see more detailed pictures! New Style! Silverware Buffet for the new bride! Top two drawers have a lined silverware block for your silverware. Add engraving to the top for your bride-to-be! New Look! 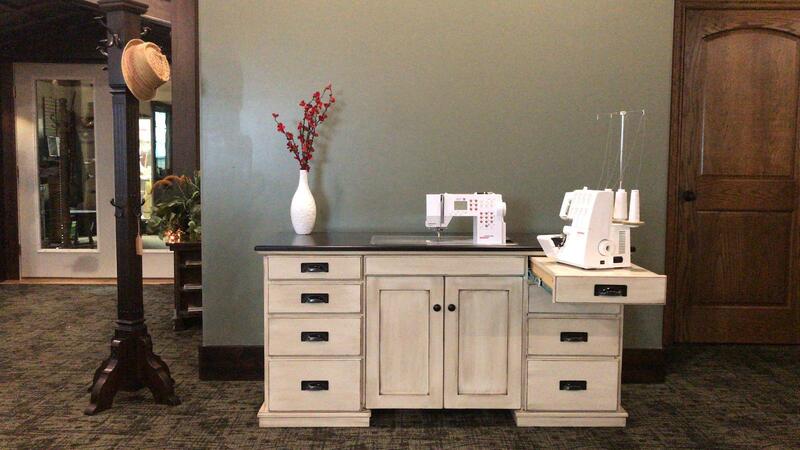 Check out our new style of sewing cabinet! Click on the picture for more details. Reno Extension Table- White Quartersawn Oak. Customize to your taste- wood specie, stain color, size, etc. Options available! Wood species, size, etc. We custom-build to your taste! Contemporary Bookcase. You design, we build it! Calico Hickory Desk- natural hickory with a dark-stained hickory top and legs. Keyboard pull-out tray. Bottom drawers on each side are file drawers. Too small for your printer? Notice the little printer cabinet beside! Everything we build is customizable! Every lady\'s dream- her own office... options are as endless as your imagination!